#StayWild Tip: Dip your toes in wild water. A stream, brook, river or gentle waves will wash those toes. 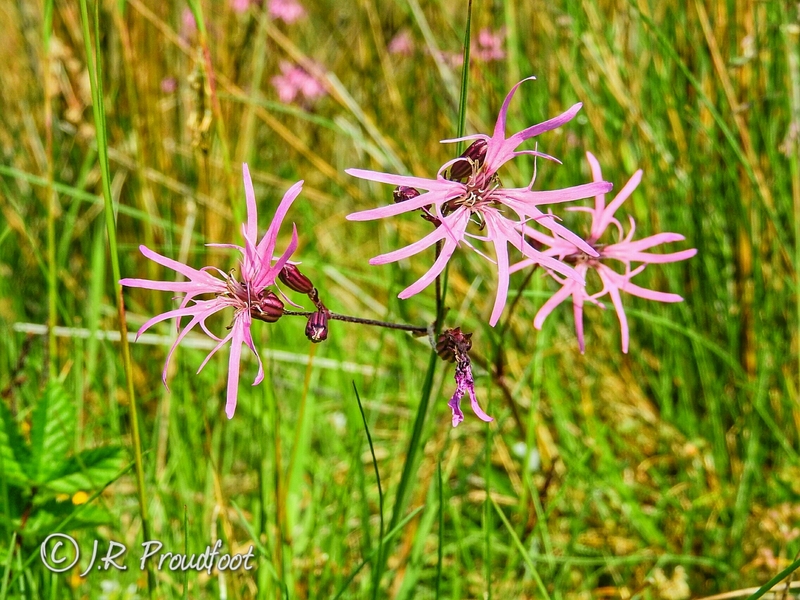 With the Scottish heatwave continuing and temperatures almost reaching the mid-twenties, the above Random Act of Wildness popped up in my 30 Days Wild app. It seemed like a very refreshing idea indeed, and I knew just the place to go. 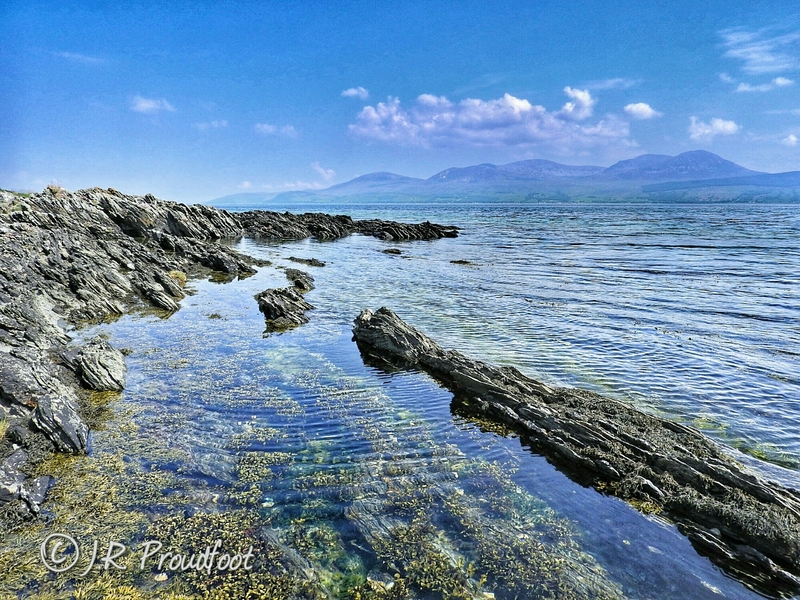 The east coast of the Kintyre peninsula, just north of Carradale, is one of my favourite places to visit in Scotland. 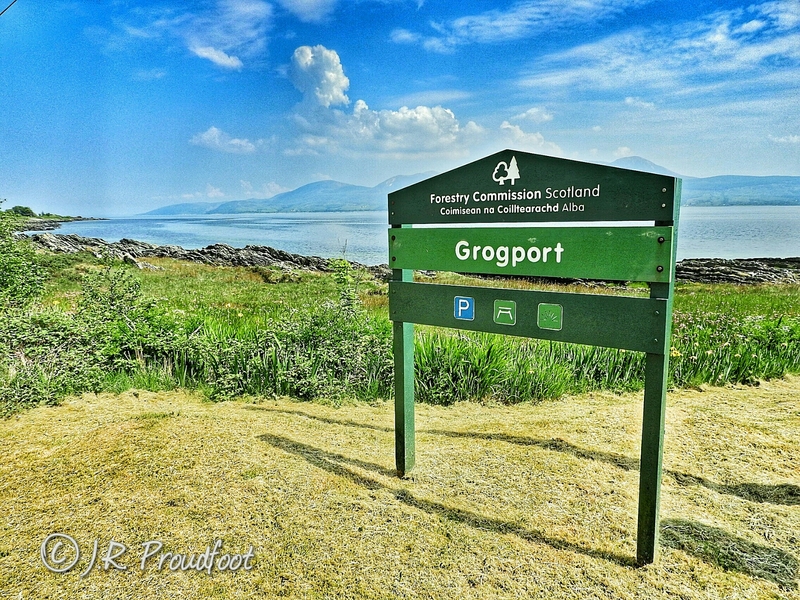 There is a rest stop called Grogport, close to a small cluster of farm buildings with a small lay-by and some picnic benches , which offers stunning views south down the Kilbrannan Sound and east to Goatfell and the other mountains on the Isle of Arran. The landscape and tides combine here to make it one of the best rock-pooling sites I have found, and I have saw dogfish, black guillemot, auks and, further from the coast line, basking sharks and gannets diving for fish. 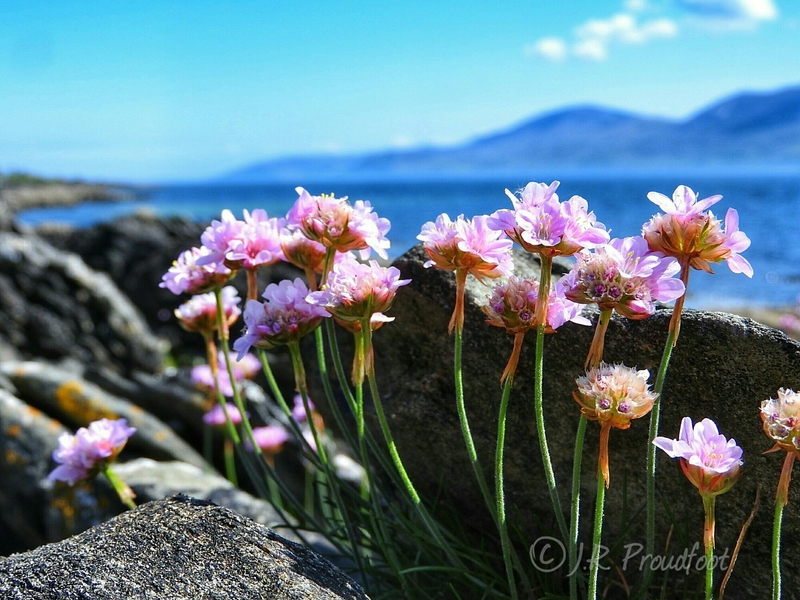 On the shore itself above the tidal zone there is a wonderful display of bright yellow kidney vetch, sea pinks, and ragged robin which were keeping the bees busy, and looked terrific against the bright blue sky and green grasses. 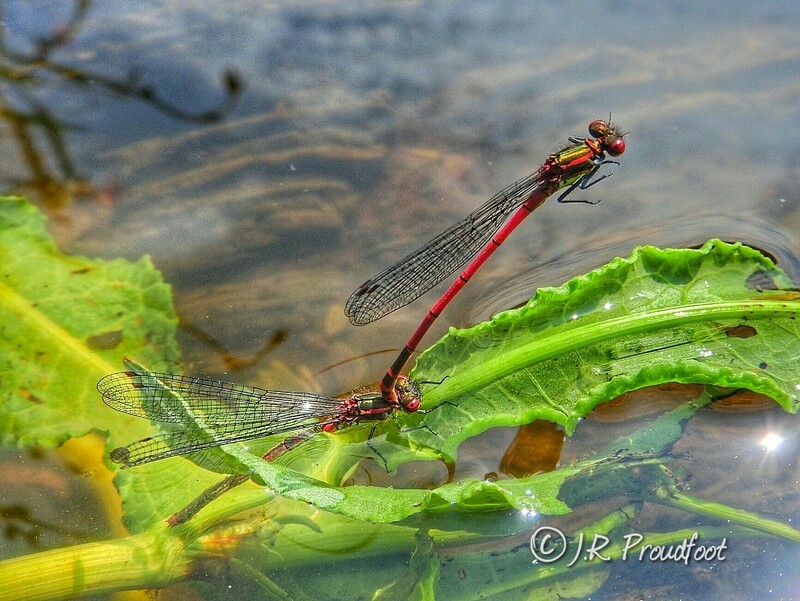 Many of the higher pools are formed from freshwater run-off, and I could have spent the day just watching the Large Red Damselflies (must’ve taken a long time to come up with that nomenclature…). They flitted restlessly, males chasing and clasping onto the females who were busy laying eggs onto underwater vegetation. 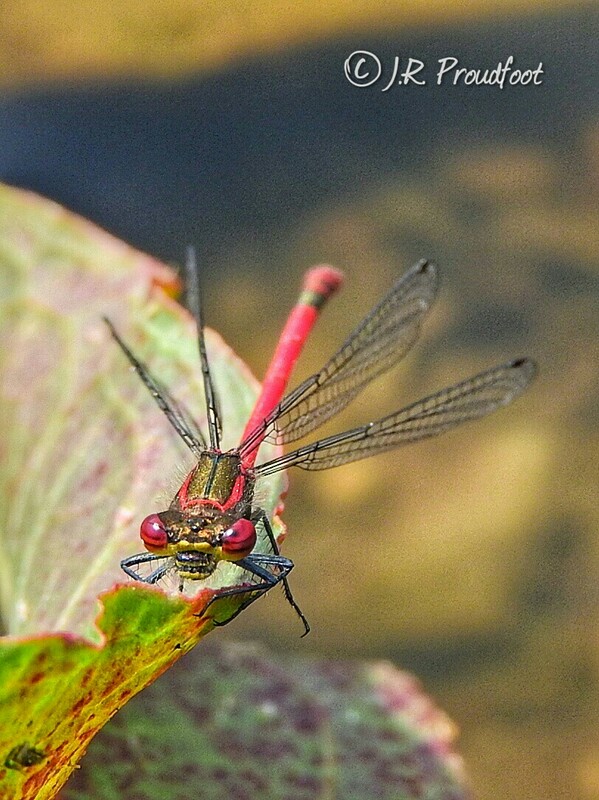 It’s a great location to see both pond life and sea life! 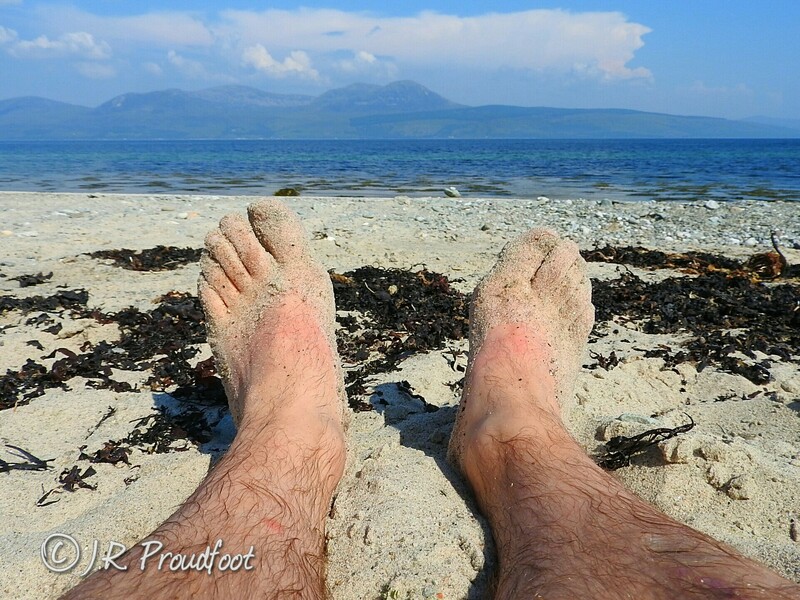 By now it was very warm and I was itching to “dip my toes”, and I headed for the deserted, sandy beach further up the coastline. 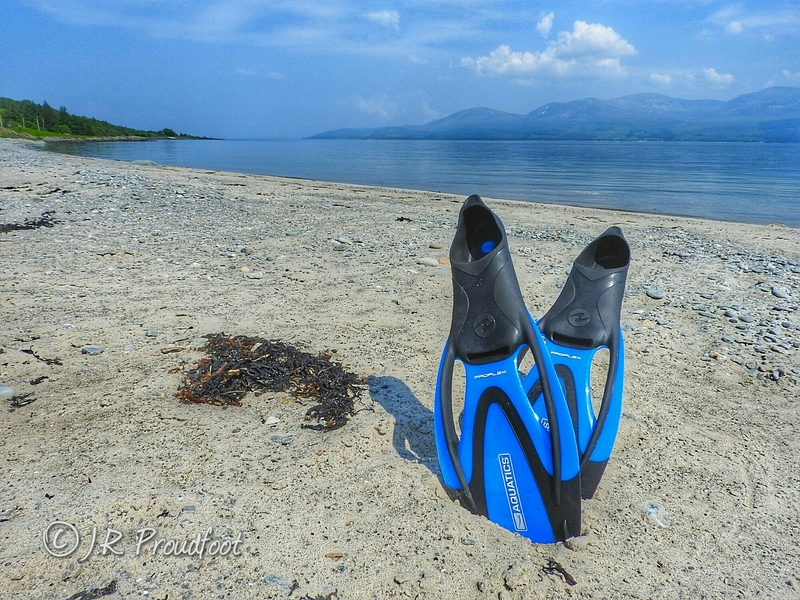 I had brought my wetsuit and snorkelling gear, and was soon resplendent in rubber and neoprene. Before I could overheat I was into the surf and exploring underwater. Now I’m not saying it was warm – I may have said some rude words at first – but it was certainly more tepid than some public swimming pools I’ve been to, and I soon acclimatised. I had a GoPro camera strapped to my head, but through a combination of inexpert flailing or just bad luck, I didn’t manage to catch much. The bottom of the sea here is a fascinating mix of rippling sandy bottom, rocky outcrops and tall kelp forests, and I could study a range of fish, crabs (including hermit crabs, which I adore), various jellies and ctenophores which rippled with rainbow light in the sunbeams piercing the waters surface. I did manage to catch this shoal of silvery, almost translucent fish. I spent a good while floating about, and soon the tide started to recede. The water temperature dropped at the same time, and as I swam I passed through shafts of water that were warm then chilled. I returned to the shore and was about to peel off the suit when I noticed a seal bobbing in the water where I had been moments before. I quickly fumbled and flapped my flippered feet back into the water to have a nosy. The seal was clearly very curious about this black, rubbery flotsam in its patch, and kept popping up close to where I was. Visibility underwater wasn’t great but I occasionally spotted the shadow of something large moving around me. On the surface, we could see each other well – I could hear it’s snorty breathing. I floated calmly to let it come close, but it never approached closer than around 10 metres. Every so often it would breath in with a sound like sighing, diving effortlessly on the spot and leaving me ducking after it in the hope of a glimpse of more elegant swimming. Soon it tired of this, and popped up further and further away until I lost it. 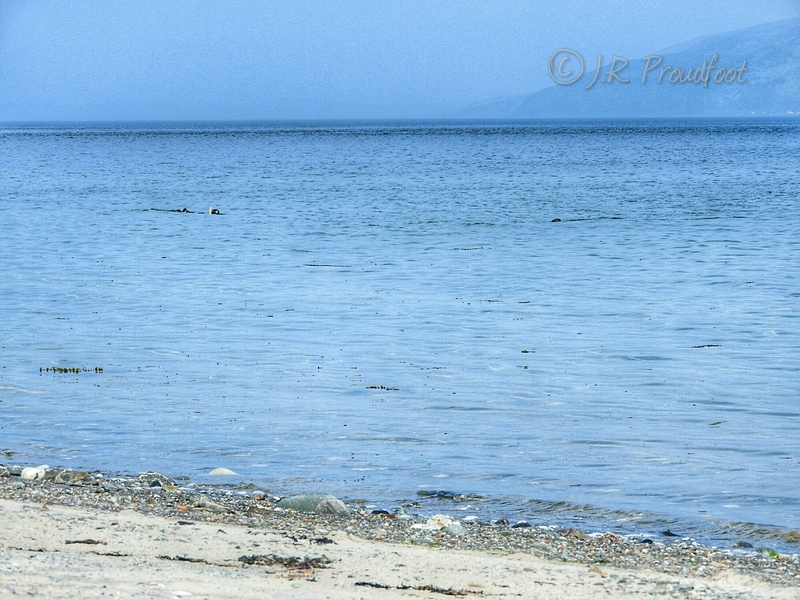 This image, captured from the shore, shows me (the black blob in the middle left) and the seal (the black blob on the middle right). By now I was a bit chilled and my teeth were chattering, so I returned to shore. 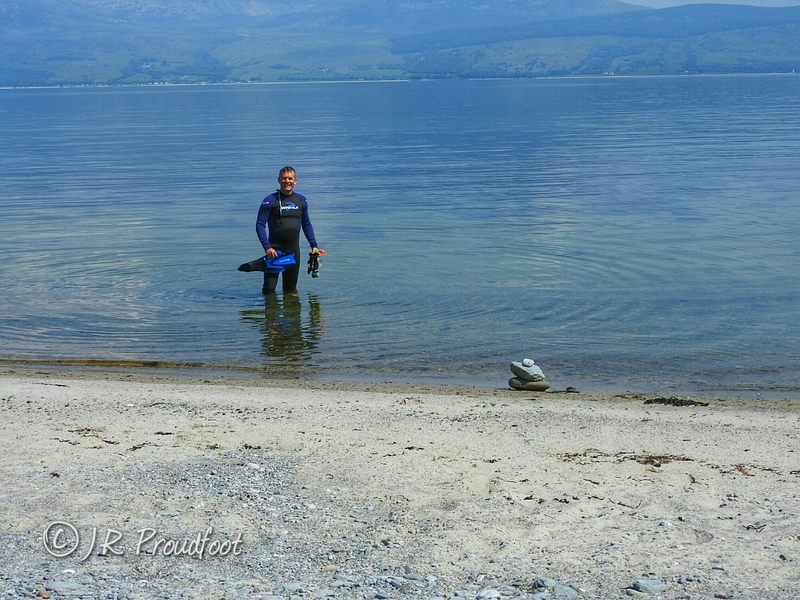 Stripping off my wetsuit and flippers (I’m no Daniel Craig, honest) it was a delight to come onto the warm shore. The sand was almost too hot to touch, and the hot, rough feel of it on my feet was bliss. The whole area was fantastic – amazing views, the smells of warm rocks and ocean, and a pleasant sense of having exerted myself. I love Scotland, and this day reminded me that it has as much to offer as any exotic location abroad, and my trip reminded me that it pays to not take your home soil (or seas!) for granted – there’s always more to discover underneath the surface.